An easy recipe for thick, creamy oatmeal packed with 16g+ of protein and plenty of sweet, juicy berries. 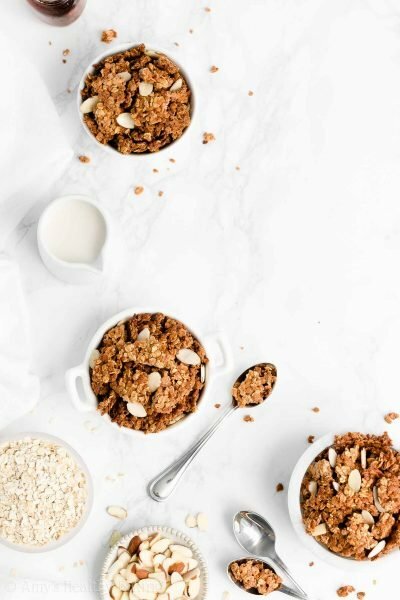 The perfect healthy breakfast for busy mornings! This past spring, my dad decided to start eating healthier. He already packed himself wholesome lunches and snacks with plenty of fresh fruit and veggies (he can’t live without his apples, carrots, and broccoli! ), so he mainly wanted to change his breakfast and dinner habits. When he received my banana bread protein overnight oats recipe in his email inbox (have you signed up for those emails here? you’ll receive all of my new recipes straight to your inbox for free! ), he mentioned to me that it sounded really good. With an overly spotty banana sitting on my counter, I offered it to him so he could make the recipe that evening. The next morning, I received a text from him, reporting that the oats tasted amazing! 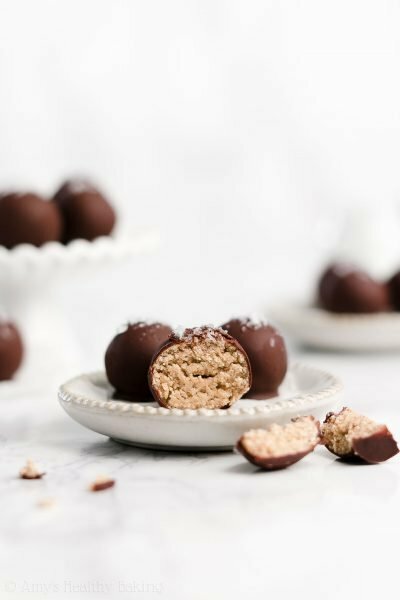 He loved the texture and the little hint of cinnamon, and he actually stopped by the store just to buy a big ol’ bunch of bananas on his way home from work that evening so he could continue making and eating those oats for the rest of the week. 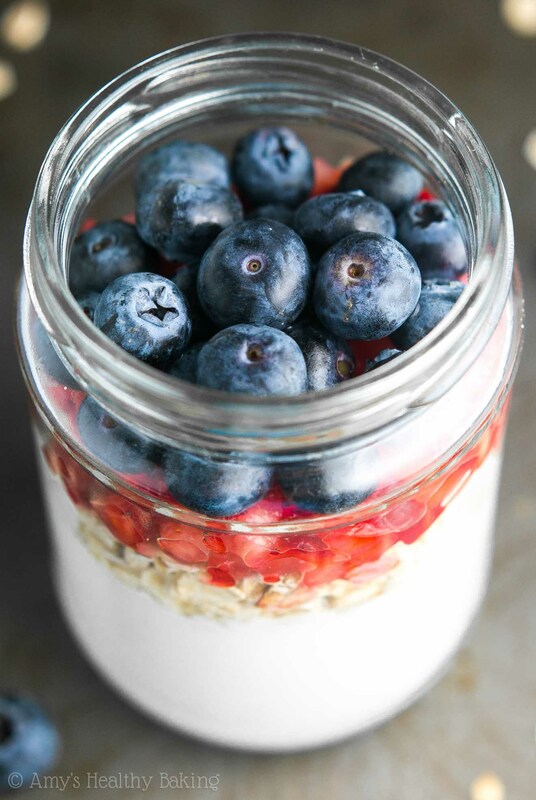 For those of you unfamiliar with overnight oats, they’re incredibly easy to make! You simply mix together the ingredients in a mason jar or tupperware container, seal the lid on top, and refrigerate them overnight (or about 8 hours). That’s all there is to it! And yes, overnight oats are meant to be eaten cold! 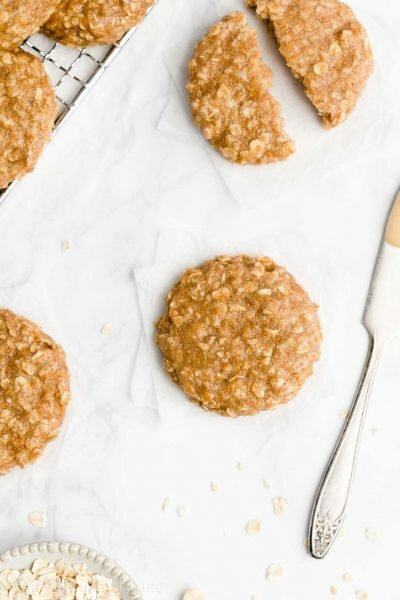 By letting the oats soak in the liquid from the recipe for that many hours, the oats soften as much as if you had cooked them the traditional way on the stove or in the microwave. This makes them great for quick grab-and-go breakfasts for busy mornings! Since making overnight oats is so easy, let’s just talk briefly about the ingredients. To start, you’ll need… You guessed it—oats! Both old-fashioned oats and instant oats (also called “quick cooking” or “minute” oats) will work. And if you’re following a gluten-free diet, make sure you buy certified gluten-free oats! However, do not substitute steel-cut oats. Those do not soften enough, and they’ll remain dry and crunchy. 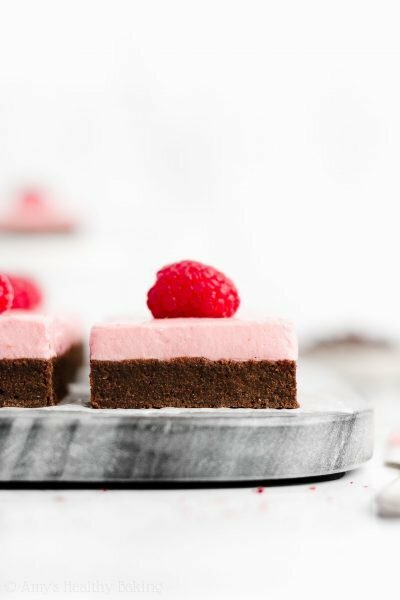 For the protein source, you’ll use one of my favorite ingredients in healthier baking. 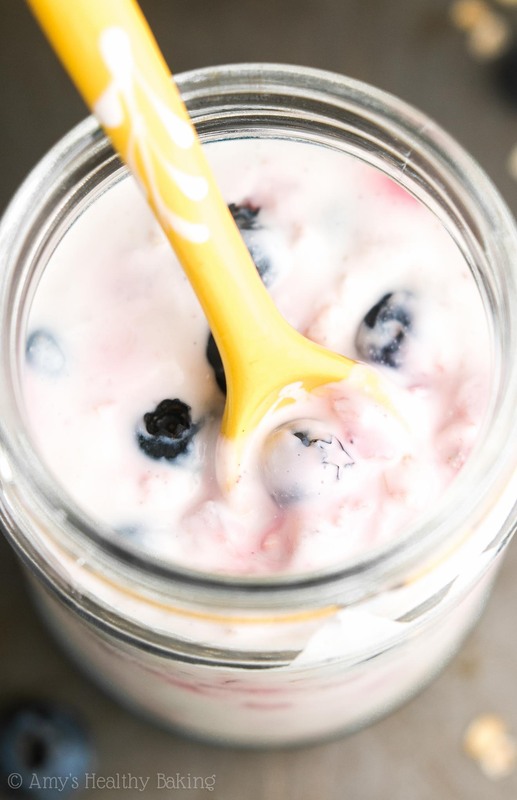 If you’ve been around my blog for a while, you already know what it is… It’s Greek yogurt! 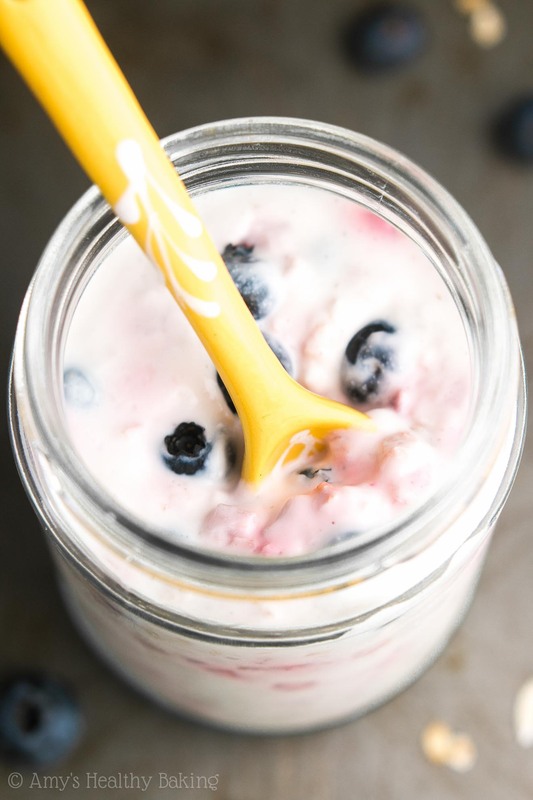 Greek yogurt contains around 21g of protein per cup, as opposed to regular yogurt that only offers around 10g of protein, so it’s a super easy way to sneak in extra protein. I always buy the huge tubs, rather than the single-serving cups, because I use it so much! And of course, the fruit! Please, please, please use fresh strawberries and blueberries if you can because they taste so much better in this particular recipe than frozen. I promise it’s worth the tiny bit of extra money at the grocery store! Time for breakfast! 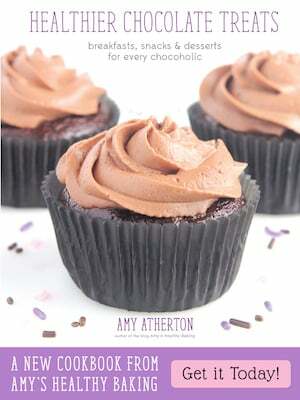 And when you make yours, remember to snap a picture and share it on Instagram using #amyshealthybaking and tagging @amyshealthybaking IN the photo itself! (That guarantees that I’ll see the notification from you! ?) 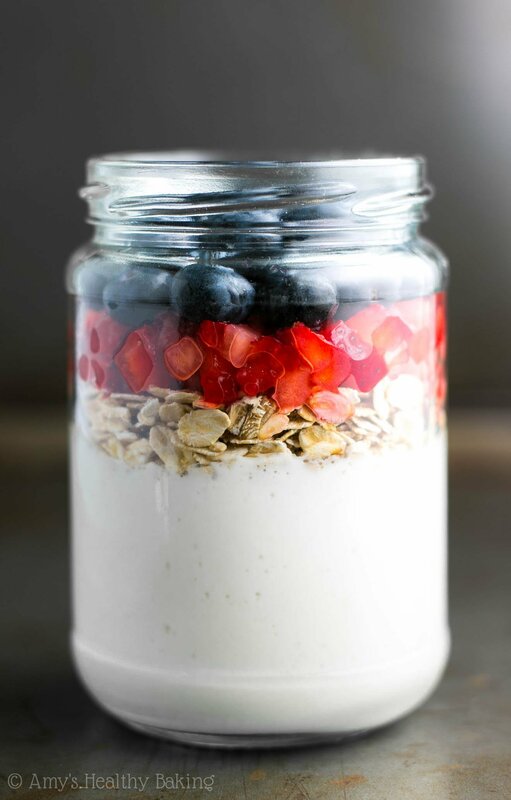 I’d love to see your overnight oats and feature them in my Sunday Spotlight series! These overnight oats are perfect for busy (or lazy!) mornings and quick grab-and-go breakfasts. The recipe is easily doubled or tripled to make more, and they’ll keep for at least 4 days if stored in an airtight container in the refrigerator. Add all of the ingredients to a glass jar or tupperware with a tight-fitting lid, and stir until fully combined. Cover and refrigerate for at least 8 hours or overnight. Any sweetener may be substituted for the stevia. 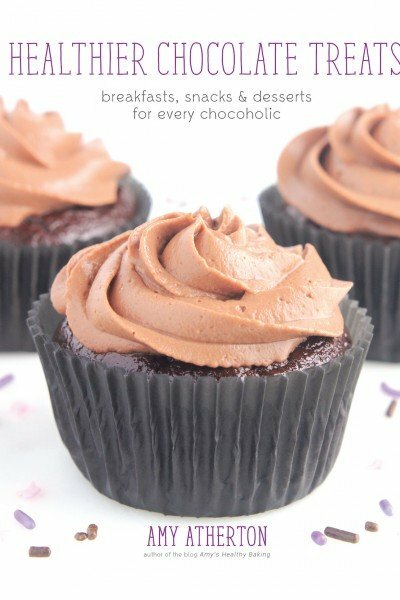 You’ll want the equivalent of about 3-4 teaspoons of granulated sugar. For the best taste, use fresh strawberries and blueberries! 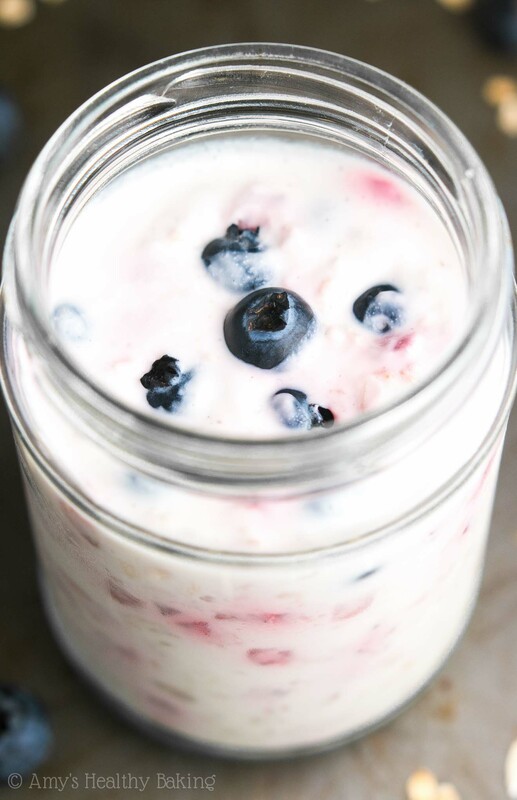 ♥ All of my “Protein Overnight Oats” Recipes! You remembered my 4th of July teaser on Snapchat, didn’t you Marina? 😉 You and your dad definitely sound just as close as my Dad and me — that’s so neat! Do you ever add protein powder to your oats? Also, how long can these oats stay in the fridge? If I was interested in making a weeks worth of grab and go on Sunday, would Friday be just as good? I don’t add protein powder to these oats because they already have a lot of protein from the Greek yogurt, but you’re welcome to add a little if you’d like. You may need to add additional milk, depending on how much protein powder you add. I actually answered your second question in the text beneath the recipe title in the recipe box already! 🙂 I can’t wait to hear what you think of these oats Cindy! 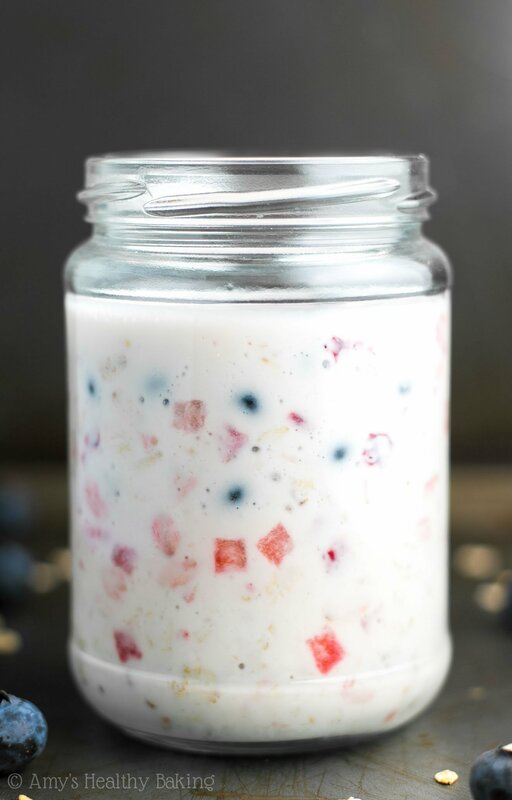 I love that you and your dad put your heads together for all your fun overnight oats ideas! You have so many good ones! These look particularly delicious. Tell him good idea with the blueberries 🙂 Perfect for summer. It has been too long since I’ve seen you Amy! I miss you! Thanks for all the congrats on my new little one 🙂 We are so excited. I hope we can get together soon! Oh my gosh – your dad is too cute! Having just had my first overnight oats last week, I’m a convert now! I’m obsessed too. In fact…can I be your taste tester too? I love that this one is red white and blue – so festive!! xo! Yes!! You can totally be my taste tester Sarah — I’d love that!! ♥ Miss you lovely! Hi there, can you use almond milk instead of cows milk please? I’ve actually answered that question already in the Notes section underneath the Instructions. 🙂 I can’t wait to hear what you think of these overnight oats Paula!